Immediately Jesu s made His disciples get into the boat and go before Him to the other side, while He sent the multitudes away. And when He had sent the multitudes away, He went up on the mountain by Himself to pray. Now when evening came, He was alone there. But the boat was now in the middle of the sea, tossed by the waves, for the wind was contrary. How many times have you been in Peter’s situation? You’ve asked the Lord for something in faith and He has said “Okay, let’s do this!” You start out in faith and obedience, full of joy and assurance that you are walking in His will, but then you look around at your circumstances and wonder if you can really do this. So you start to to try and find other solutions or try grasping at straw to keep yourself afloat and your dream alive. Soon, panic starts to set in and, like Peter, you begin to sink in despair. I have found myself in that situation recently. God brought a wonderful woman from the Philippines into my life. In September we will be getting married there and then she and her daughter will follow me back to Canada after 6 to 9 months. All has been going smoothly and each step of the way God has been providing the funds necessary for my airline tickets, shots, passport and travel insurance among other things. But then I started to look at my income and the amount of money that will be needed to cover everything I started to worry. Even as I write this I feel panic trying to push it’s way in. I’ve tried raising some of the money through what I thought was a sure way to bring in funds and have found that it has turned out to be more of a drain instead of a benefit. After seeing it’s failure yesterday and the hope of it helping me fade yesterday, I gave into despair and lost hope. I began to have that sinking feeling. I began looking at the waves and thought this is impossible. There is no way I can do this. There is absolutely no way I can pull off with all that I have to do in the next couple of months if I try to do it myself and trust my flesh, but, if I take my hands off and just trust Him to do it, I know He will. He never points you in a direction and then leaves you to your own resources. The only one that should get the glory is Him and if we do it than it takes away from that glory. For me, faith is difficult. I like to rationalize and plan things out so I know exactly where each dollar will come from and where it will go. I’m having to do things I have never done before and God is trying to stretch my faith. He has never, in my entire life, failed me and yet I still try to analyze things. 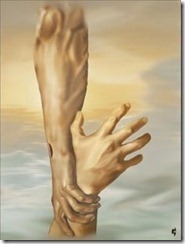 Every time I sink, He reaches out His hand and picks me back up. He calms the storm and reminds me of His goodness. He is so patient with all of us. I know God will take care of everything and work out everything that is ahead of me; He always does. As the time nears for me to leave, and while I am in the Philippines, I want to write about how God provides for us as we do His will. I want you to rejoice with me in the miracles of His provision. When we take a step of faith, He moves with us. God is pushing me out of my comfort zone as He will with some of you as well. Just know that He has promised to go with us all the way. Just trust Him.